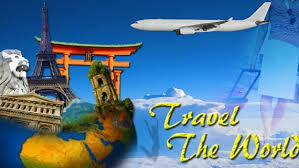 Dr. Angelo O. Subida, Psychotherapist: Travel is Healthy! Travel is good. Based on ample studies and evidences, its highly beneficial to your mental, emotional, spiritual, and physical health. Many years ago, I was in one of the lowest points of my life. Feeling over-stressed personally and professionally, I felt tired. I just wanted to stay in bed and not do anything. Then a DHL courier knocked on my house gate with a package for me. In it includes a free two-way travel ticket to Seoul, Korea with all-expenses paid accommodation for 30 days from a known sponsor. The development of a possible depression in me that time was stopped. My "foreign travel without money" brought in a fresh supply of fuel into my mind, heart, and spirit. After that vacation, I got back home and to family and work with overflowing zest! According to a psychological study from Cornell University, there is a direct link between the experience of happiness and even just planning a trip. It also showed scientific proof that traveling reduces stress levels, relieves anxiety or depression, even rather dramatically. Anthony was a very resistant patient. Even after months of sessions, he still felt stuck. He watched self help videos, read materials, did gym workouts etc. in addition to his therapy sessions. Still nothing seemed to work for him. Since he wanted to experience change in his life, he tried travel. He went to Japan with his wife and two young kids. He moved from place to place, from snow to snow there. And in the process, he started noticing receiving bits and pieces about himself. When Anthony went back to session after a couple of weeks, he seemed to have showed a different view of things. The newer, unique life perspective resulted not only from his self discoveries but also from the culture or peoples he connected with along the way. Henry Miller described aptly this one healing benefit of travel, "One's destination is never a place, but a new way of seeing things." Travel makes you healthier. Don't miss its high benefits to heal or reinvent your life.